They, them, and their are gender-neutral pronouns used in English to refer to more than one person or thing. “They’re on their way. That’s them now.” “The chairs are on their sides.” And get this: those three are the only ones we have. These pronouns have been used for centuries in speech when the gender of a single person isn’t known: “If someone asks for me please tell them I’ve gone to the store.” “Someone left their coat on the chair. I imagine they’ll be missing it soon.” Such usage is slowly becoming acceptable in written language, a trend that has been accelerated of late by their widespread adoption by gender nonconforming and genderqueer people. It’s certainly appropriate for people to choose the pronouns by which they prefer to be identified, but I have to say the appropriation by individuals of the only (so far as I know) English group pronouns leaves us with no pronouns when we need to refer to groups of people or things. I would hate to see the English language left without pronouns that differentiate between one person and several or many persons. It’s just damn confusing. And so, genderqueer and gender nonconforming people, those of you who prefer to be referred to with the pronouns they and them and their, perhaps you would be so kind as to invent new plural gender-neutral pronouns for yourselves rather than appropriating the only ones we have. 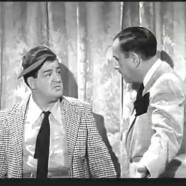 You know the old Abbott and Costello Who’s on First baseball routine, right? If not, you should. Here it is in part. It’s wonderful word play. Bud Abbott: Strange as it may seem, they give ball players nowadays peculiar names. Abbott: I’m not asking you— I’m telling you. Who is on first. Costello: I’m asking you— who’s on first?